Not exactly close to home but the Rockefeller Centre Christmas tree has gone all ‘Eco’. 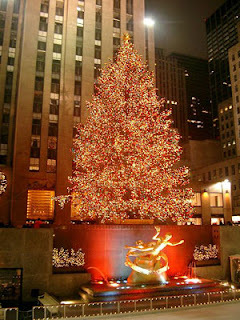 A main attraction of the Centre in New York, the tree normally consumes a vast amount of energy due to all those tiny lights. This year the tree will be illuminated with 30,000 LED lights which use much less energy and are expected to reduce the consumption from a previous 3,510 kilowatt hours per day to around 1,300. That saving, it seems, is the equivalent to the amount of electricity used by a small house in a month!